Oat grass, also known as groats or oat straw, is the plant Avena sativa, which grows the grain that we use as oatmeal. It can be grown in gardens or is available in nutritional supplements. Cereal grasses such as oat, alfalfa, barley and wheat have healthy benefits for your green lifestyle. Oat grass, of the genus Avena, has been a significant source of food for animals and humans since prehistoric times. It is a stable food crop that humans learned to cultivate. Nutritionally, it is a good source of beta-carotene, vitamins K and C, folic acid, B vitamins, protein, fiber and calcium. It may be taken dried, but is generally eaten raw or juiced, preferably with fruits or vegetables to disguise the strong taste. 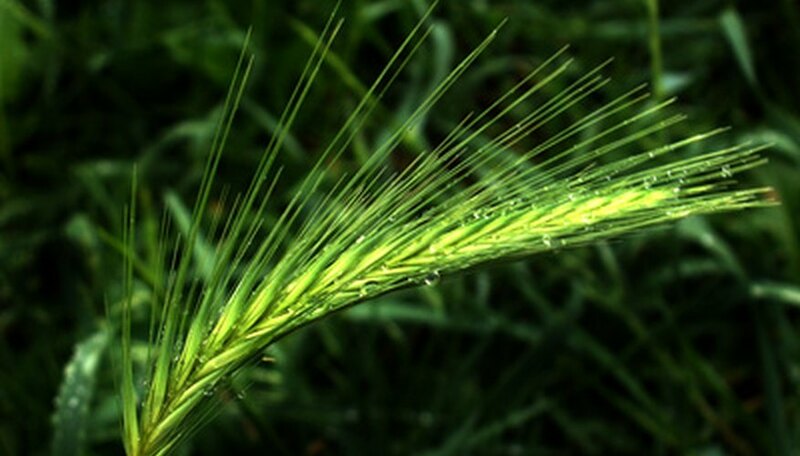 Oat grass, like oats, may help lower unhealthy cholesterol levels. You may get more energy and stamina when you eat oat grass. Exhaustion and nervous conditions may improve with regular consumption of oat grass. It may be helpful in lowering blood sugar levels and preventing cancer. Growing oat grass may actually improve soil quality, particularly when rotated with other crops. The roots are very good at holding the soil together, which helps prevent soil erosion. Humans are exposed every day to pollution and low-level radiation. Oat grass helps detoxify the body and balance out excess acidity. It may also boost the immune system. Plants high in chlorophyll may work like the hemoglobin in our blood stream to help carry oxygen and nutrients to where they are needed most in the body. Pets, like similar species in the wild, are meant to eat at least a small amount of greens. The enzymes in oat grass seem to be particularly helpful for the digestive tracts in some animals. Small containers of oat grass can easily be grown indoors as long as there is sufficient sunlight. Cats especially will take an interest in sprouted grasses.